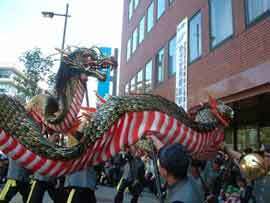 The Dragon Dance is one of the central features of the Nagasaki Kunchi. Photo Courtesy of Nagasaki Traditional Arts Foundation. For three days in the beginning of October, Nagasaki bustles with the Kunchi festival, which dates back over 300 years. The Kunchi festival’s main event is the dragon dance. The dragon, which is manipulated by ten people, attempts to eat a golden ball, called Tamamochi. The golden ball symbolizes youthful immortality. The dragon dance, which is performed to the sound of ancient Chinese musical instruments, is a good example of the influence of Chinese culture on Japan. Nagasaki was the only port in Japan where foreign trade was allowed during the Edo period, from 1603 to 1868. Therefore, it was richly influenced by others, including the Chinese and the Dutch. Even today, many people in Nagasaki celebrate Chinese New Year.